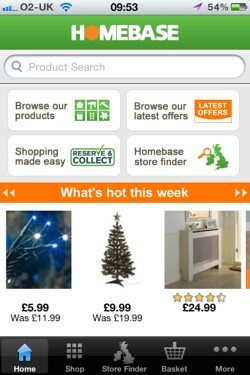 Homebase has unveiled a new mobile optimised site as it seeks to expand its multichannel offering. As well as being fully transactional, the mobile site has a store finder function that allows users to check if the product they need is in stock and reserve it for collection later that day. The idea is to use mobile to help drive footfall in-store, which is a strategy we’ve seen recently from both L’Oreal and Guess Watches. In May Homebase revealed that more than a third of its customer research online before going into a store, which highlighted the need for multichannel commerce tools such as reserve and collect. The launch of the new mobile site shows that Homebase is continuing to develop its multichannel strategy, but is the site any good? More than a third of Homebase customers research online before going to a bricks-and-mortar store, according to the retailer’s head of multichannel. During a speech at the E-Commerce Futures Conference this morning, Andy McWilliams said it highlights the need for a joined up approach in-store and online.